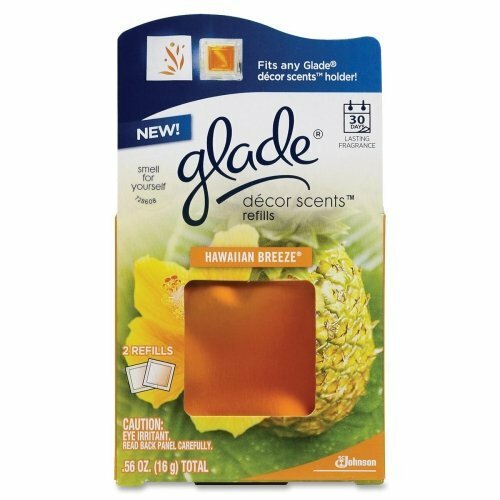 Air freshener refills deliver the scent of a breeze off the Pacific Ocean mingling with the Hawaiian pineapple groves and tropical flora to bring a feeling of paradise to your commercial area every day. Each fragrance-infused gel cartridge slides into the Glade Decor Scents Electric Warmer or Glass Holder (both sold separately) and is gently warmed so scent is released gradually and doesn't overpower. The Hawaiian Breeze Scent fragrance cartridge lasts up to 30 days. If you have any questions about this product by dRA, contact us by completing and submitting the form below. If you are looking for a specif part number, please include it with your message.